Please enjoy a piece of warm sound image surfaced lightly at one night after the rain. one more videos are exhibited every in a week.and the album going to release in the end of July.and available to get from all over the world. untitled #1 from the album "after the rain - silence in yufuin - " from Yufuin CREEKS. on Vimeo. untitled-3 from the album " after the rain" from Yoshiyuki Tanigawa on Vimeo. untitled #3 from the album "after the rain" from Yufuin CREEKS. on Vimeo. 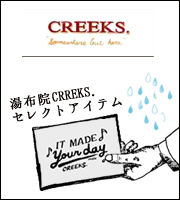 ◆ after the rain " at CREEKS." ・album title：after the rain " silence in CREEKS."